The Nordic countries are often positioned as digital front-runners in both the European and global contexts. 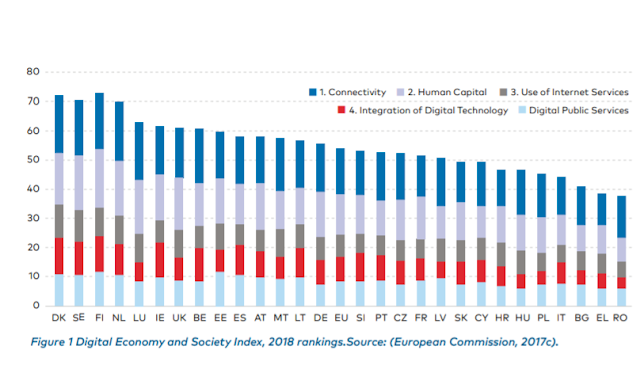 In the European Commission’s Digital Economy and Society Index, Denmark, Sweden Finland and the Netherlands (in that order) top the list in terms of the overall ranking, as well as performing well on individual indicators (see Figure 1). Norway also performs well on the indicators, despite not being formally included in the ranking. 5) digital public services (e-government) (European Commission, 2017c). We find that Nordic countries also rank highest in the tables for each of these aspects. Finland leads the way on human capital and digital public services, Denmark on integration of digital technology and Norway on Internet use. Alongside the agenda at the European scale, work has also occurred to map the state of play with respect to digitalisation in the Nordic–Baltic Region (Wernberg and Andersson, 2016). To date, two reports have been released that map indicators across the Nordic–Baltic states, with the most recent having a particular focus on cities (see Baltic Wernberg and Andersson, 2016). The Nordic countries perform well in the Nordic–Baltic context. Again, however, there is substantial variation in performance based on different indicators. For example, there are quite large gaps between the countries when it comes to the use of e-procurement in firms or private R&D expenditure in science and technology, whereas rather small gaps exist when it comes to fixed broadband penetration and startups in ICT across the Nordic–Baltic countries (Wernberg and Andersson, 2016). Another report based on the Boston Consulting Group’s E-Intensity Index4 includes Denmark, Finland, Norway and Sweden among nine European ‘digital front-runners’5 (Alm et al., 2016).6 The report highlights the higher share of e-GDP 7 in these countries (8% on average) compared with what it terms the ‘EU Big 5’8 (where e-GDP is 5.1% on average). Accordingly, the research suggests that these countries stand to make the greatest gains from further digital advancement, particularly full realisation of the European digital single market and further digitalisation in emerging fields (e.g., IoT, advanced robotics, big data analysis and augmented/virtual reality). At the same time, the authors argue that these countries have more to lose if Europe fails to keep up with the rest of the world. They are highly critical of European action on digitalisation, suggesting that ‘the window of opportunity is closing fast’ for Europe to position itself as a global leader in this space (Alm et al., 2016: 19). The report estimates that, based on the current pace of development, even the front-runner nations in Europe will be behind China, South Korea, Singapore and Taiwan by 2025 (Alm et al., 2016). It suggests that the front-runners should work together to share good practice (all are strong in different areas) and take a leadership role. This includes both ideological leadership—to address the concerns of more pessimistic nations—and practical leadership to target the currently broad EU strategy (Alm et al., 2016). Nordic cities are also front-runners when it comes to various smart technology solutions, including the management of urban systems and environments. Nordic cities have been early adopters of ICT infrastructure in cities, and of knowledge expansion through the implementation of 'smart city' solutions. This builds on a long tradition of developing infrastructure to support the digitalisation of public services. For example, Finland was the first country to declare that broadband access was a legal right for every citizen and Sweden ranks fourth in the world in the percentage of fixed broadband subscriptions on fibre-optic networks (Borges et al., 2017). Sweden is among the most successful countries in developing community based broadband initiatives, so-called “local fibre networks”. The Swedish Local Fibre Alliance has supported local governments and communities to plan and launch municipally owned and managed networks (ENRD, 2017). The Swedish government is committed to providing expanded high-speed Internet to rural areas and Stockholm is expected to be the first city in the world with a 5G network in 2020 (Borges et al., 2017; NyTeknik, 2018). In terms of the provision of public services, recent research found that the Nordic cities were the most digitally advanced in Europe, independent of city size (ESPON, 2017). The study also showed that there is a generally high confidence level regarding the readiness of cities to respond to digital transition and seize the opportunities of digitalisation.